I returned from the Chicago trip with the nagging feeling I had forgotten something. 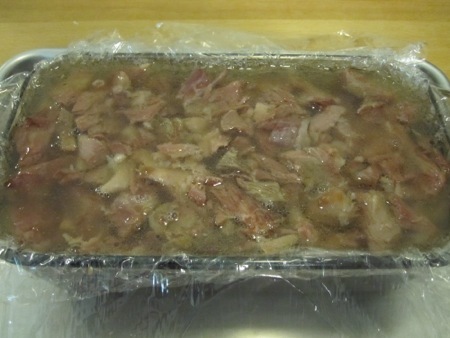 As frequently happens when I’m trying to retrieve information out of long-term storage, the elusive memory revealed itself to me at three in the morning: You have to make a head cheese, and you have less than a week in which to do it. Other people have night terrors, I have dreams about mise en place and failed recipes. 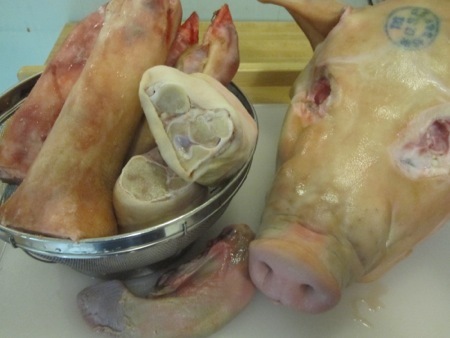 After a fitful sleep, I retrieved four huge trotters and two hocks from the Deep Storage Facility and put them in the fridge to thaw while I visited my butcher, who happened to have a pig’s head in the freezer. 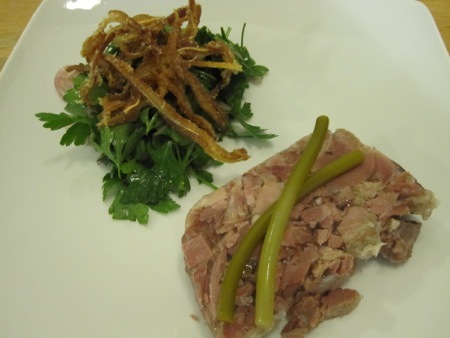 He couldn’t tell me if the tongue was still in the head, and I was unable to locate a fresh pork tongue, so I resigned myself to making fromage de tête without it. Much to my surprise, once the head was thawed the tongue flopped out, providing me with my missing ingredient. I still wouldn’t have time to give the tongue a full cure (not unlike the cure for Canadian bacon), but I had a workaround in mind. I gave the meat an overnight soak in a salt and sugar brine that also included pink salt, which gave a lovely piggy color to the bits the next morning. It also served as a partial cure for the tongue. I managed to just fit everything into my largest pot – a lobster steamer – to which I added two cups of wine, a bouquet garni, bay leaves, garlic, peppercorns, and cloves. I filled the pot with almost enough water to cover, leaving one ear still breaking the surface. 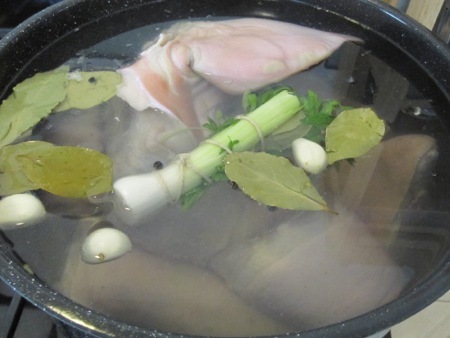 Once the pot came to a simmer, I cut off the ear and submerged it with the rest of the pork parts. After about four hours of gentle simmering, I removed all of the meat, which was falling off the bones. 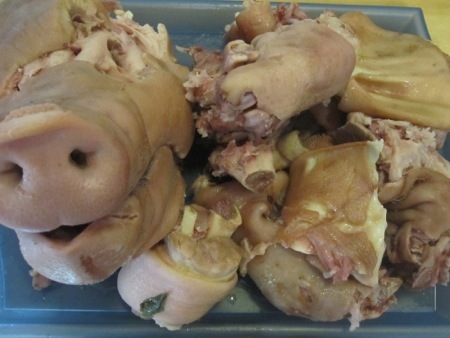 Despite their size, the trotters were nearly meat-free, but I was able to pull a good amount of meat from the head and hocks. After peeling the tongue – not something I enjoyed doing, especially after reading all of A Song of Ice and Fire – I diced it into half-inch cubes. 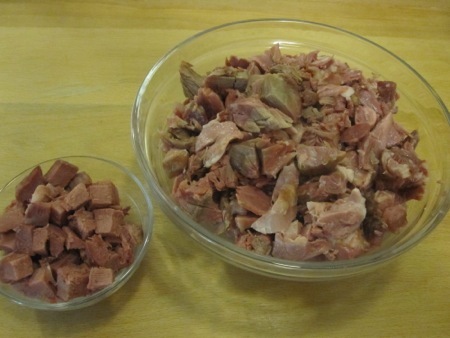 I gave the rest of the meat a rough chop to create a mix of larger pieces and small crumbly bits. I kept both ears, storing them in the fridge until I figured out what to do with them. 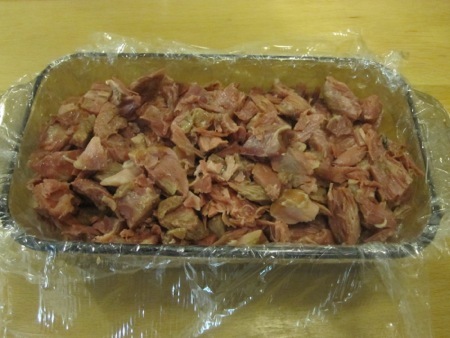 I wound up with exactly enough meat to fill a plastic-lined glass loaf pan. This is where I chose to deviate from my previous failed effort. 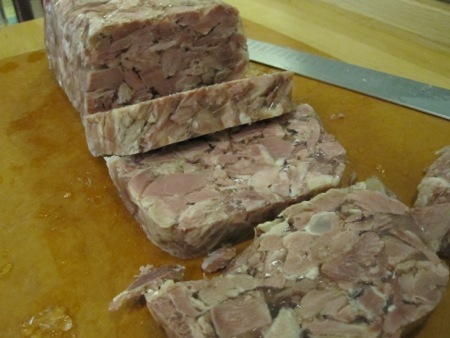 My terrine mold is too narrow, which contributed to my last head cheese falling apart when sliced. I figured a larger cross-section would make slicing easier, hence the loaf pan. After reducing the cooking liquid and testing it for seasoning as well as gelling power, I filled the mold with a few cups until all the meat was covered. I should have let the gel cool a bit before covering it with the plastic wrap and refrigerating it. As the pan sat in the fridge overnight (on a quarter-sheet pan), the still-liquid gelatin wicked up along the plastic and spilled onto the tray. I wound up with rough top surface in the pan, but, when ummolded, it became the bottom. 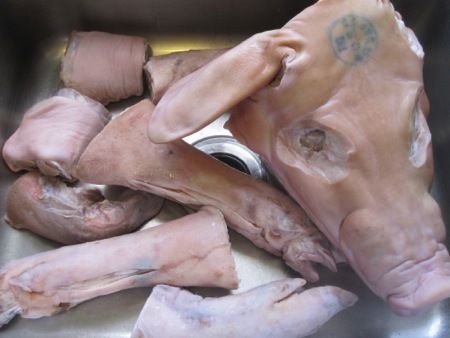 Before unmolding the head cheese, I thinly sliced one of the pig ears. 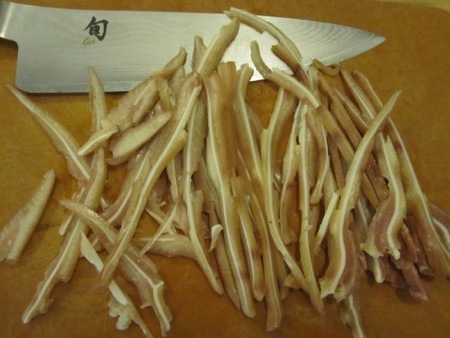 After a quick fry in hot oil I had lovely strips of crispy pig’s ear. I chopped some parsley, sliced a shallot, and made a quick vinaigrette from lemon juice, olive oil, salt pepper, and a pinch of xanthan gum (now a constant addition to my salad dressings). I tossed the salad together, then turned my attention to the big moment: slicing the meat. Much to my relief, it remained solid and sliceable. I plated the salad, topped it with the crispy ears, added a slab of porky, heady goodness, and garnished it with some pickled garlic scapes. Credit where credit is due: He Who Will Not Be Ignored suggested this as a dinner instead of an afternoon snack. The meat was more subtly flavored than I had expected, but now I know to boost the spices the next time I do this; and I will do it again. 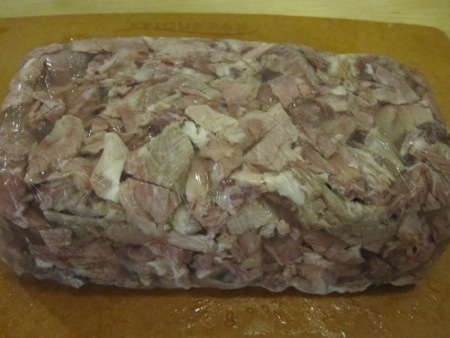 As for the rest of the head cheese, there’s a sandwich in my future, but you can read about it elsewhere. The man’s a freakin’ genius. Love the idea of the crispy pig ears. Thanks! He Who Will Not Be Ignored pretty much demanded crispy ears. Thanks for reading, I’ve seen your comments on a lot of the blogs I read. If you’re really into this whole pig thing, you really need to try a feijoada. And a few caipirinhas. 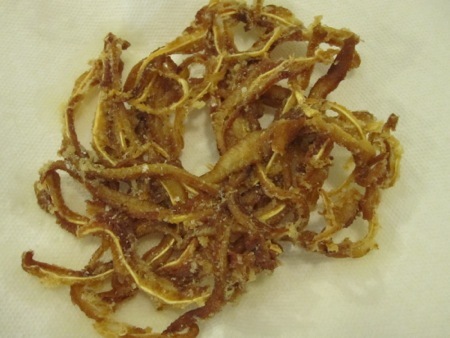 Trust me — best way to use the more unusual parts ever, although crispy pig ears sound surprisingly good. I’ve had feijoada, I live in an Azorean neighborhood.